Here is an interesting concept: a vegetable garden constructed entirely on bales of hay and compost, requiring fewer watering events. 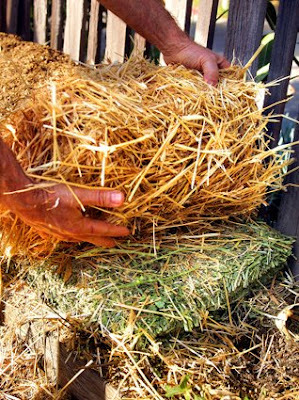 PAT MARFISI carries bales of alfalfa hay and straw into the center aisle of his Hollywood Hills vegetable garden and begins tearing off pieces of the stuff. He doesn't have any animals to feed, just his "no-dig" landscape: raised beds using lasagna-like layers of fodder, bone and blood meal and compost -- and remarkably little water. Now that Gov. Arnold Schwarzenegger has declared a statewide drought, Marfisi's 300-square-foot patch seems more relevant than ever. It's his personal horticultural laboratory for a low-water, sustainable technique he learned working on organic farms in Australia last year. The rest of the article can be found here. 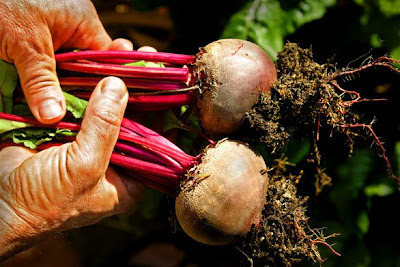 A slide show can be found here and here are some tips for no-dig gardens. That is crazy! Did you see the air garden on Oprah yesterday? No, I didn't. Bummer! I'll have to see if she has anything on her website. Thanks for the tip!